Beautiful and unusual Pictures of Lighthouses and Lighthouse Images with Beacons and Stormy Seas. In this article we have put together a collection of lighthouse photos that surely do these historic structures justice. For the worlds best and most beautiful lighthouse pictures and Images. We've got lighthouses in storms, unusual lighthouse images, lighthouse beacons, and even a lighthouse on dry cracked land. Pictures of a lighthouse are ubiquitous. Pictures of lighthouses range from serene sunsets to images of lighthouses in raging storms. Lighthouse pictures can show short squat lighthouses or shots of lighthouses that are tall, slender and majestic. Most lighthouse pics are shot by tourists and show the lighthouse in the middle of the day, under placed conditions and with little or none of the splendor or majesty that they deserve. In this article we have put together a collection of lighthouse photos that surely do these historic structures justice. Lighthouse symbolism is powerful, cross-cultural and universal in nature. We are ingrained from our early youth to see the lighthouse as a powerful source for good, and as such the lighthouse has become highly symbolic in a myriad of ways. A lighthouse is a symbol of guidance and salvation, of hope and promise, and yet also of danger and risk. It can be used to symbolize the way forward, the future, and even a spiritual path. Lighthouses are built to protect sailors and ships in storms, fog and conditions that are less than ideal. Picturing a lighthouse in a storm, that is creating an image in which the lighthouse is functioning in the element for which it was designed, accentuates its beauty as well as its symbolism. A lighthouse storm with crashing waves and lashing rain is a much more dynamic visual and serves to both capture our attention and to drive home those concepts such as guidance, security, safety and the way forward. That lighthouse is going to bring us home safely and on a deep level we find it comforting and reassuring. Though the first lighthouses were probably bonfires lit on the edge of sea cliffs, the Egyptians were the first ones to build them into permanent structures that used light to guide ships. They built the tallest lighthouse ever at 450 feet tall. That lighthouse is said to have lasted for a 1,000 years. It was built on an island in the port of Alexandria on the banks of the Nile. The Phoenicians, Greeks and Romans also constructed lighthouses. Early modern lighthouses used wick lamps as a light source and their beams could only be seen for a few miles. It was in 1822 that a Frenchman named Augustin Fresnel invented the lens that was destined to change bringing the lighthouse into the modern era. He devised a way to use prisms to magnify the light. It was in 1841 that the first Fresnel lens was installed in a lighthouse. Boston Lighthouse is an unusual lighthouse because, as the oldest light station in the United States, Congress has declared that Boston Lighthouse always be staffed. Boston Lighthouse is the only lighthouse that is not automated. It is the responsibility of the keeper to light the beacon at night and turn it off at daybreak. Boston Lighthouse is the first lighthouse built in America, on Brewser Island, in Boston Harbor. First lit in 1716, the lighthouse was destroyed during the Revolutionary War and the tower that stands today was built in 1783. Lighthouse images can serve both as fine art decoration and as commercially important illustrations for advertising and promotion. Framed lighthouse pictures make great wall décor for any room, while lighthouse photos, used in advertising and promotion, strike a familiar chord with everyone resulting in compelling messages. Lighthouse galleries can serve both commercial and fine art communities providing a wealth of material for any visual need. Pictures of lighthouses differ somewhat from images of lighthouses. 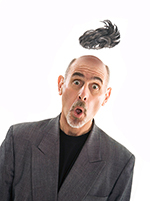 Pictures refer to simple snapshots where as images can be created and enhanced to emphasize important elements or parts. 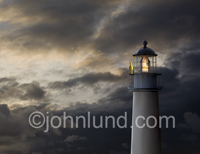 For example, in the lighthouse stock photos seen below, the storms are created and/or enhanced, the beacons added, and the impact and symbolism dramatically accentuated. Images of lighthouses are created that could never be captured in a simple picture do to problems of visibility, safety and the limitations of reality. This is particularly true of lighthouse pics that portray night scenes. Lighthouses at night are quite challenging to capture on in a snapshot and can seldom if ever match the image we hold in our minds. Any lighthouse picture can be used for wall art and décor, but given that there are so many incredible pics to choose from, why settle for the mundane? Through Internet searching it is possible to find the perfect lighthouse photo for a framed matted print, whether it is a lighthouse on a cliff, a black and white lighthouse photo, a lighthouse poster or a lighthouse background. When searching for lighthouse pix try using as precise a search description as you can to locate the closed existing image for your particular needs. When choosing a framed lighthouse picture, or a lighthouse pic for use in an advertisement or promotion, or even as a lighthouse calendar or greeting card, it is important to choose images for which the rights are clearly available. You will also need to be sure that the image you choose has the necessary resolution and quality for the intended use. Creating a lighthouse poster will require far more in file size than for a simple post card use. Whether your final desired image is of a lighthouse in a storm, a lighthouse in a sunset, a lighthouse sending its beacon out through heavy fog and mist, or just a lighthouse background, if you search thoroughly and choose carefully you can be sure that the right lighthouse galleries can be found for your intended purpose, with lighthouses of appropriate symbology, and of a size and quality that can deliver your message, or viewing experience, with a strong and satisfying emotional connection.